This is a photograph of my automata. 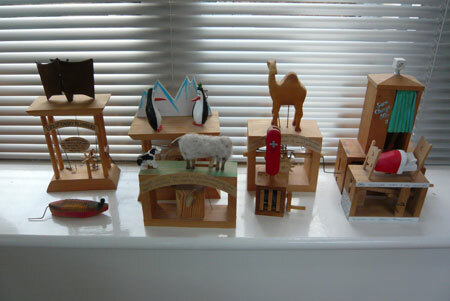 I have been collecting them for years from places such as the Cabaret Mechanical Theatre and Dansel Gallery in Dorset. They are made of wood and move in an amusing way when a handle is turned, I love them and would love to have more – but they are expensive because of the amazing imagination and craftsmanship which goes into each one. They are so funny too, wish I could show you them working…. Ooh, make me one when you have a spare 5 minutes….